Sorry we haven’t updated the blog in a while. We’ve been exceedingly busy trying to get the house in order and still find time to make it to our hospital to see our kids. Also, our internet and phone provider has not been very cooperative the past few weeks. Friday we arrived at the hospital early in the afternoon. We knew that NBC Action News wanted to do a story on our four bundles of joy but we wanted to talk to the doctors and public relations to see what was allowed and what wasn’t. I will admit as a father I’m overly concerned for their health and well being so I lean towards the extreme of no visitors and no photography so the interview which might provide greater exposure for the kids was something that gave me a lot of nervousness. We got to the hospital and received wonderful updates on the kids. Caleb was rocking the cannula and had been upgraded to 9 hours at a time. Elijah and Elizabeth were doing 3 hours at a time. 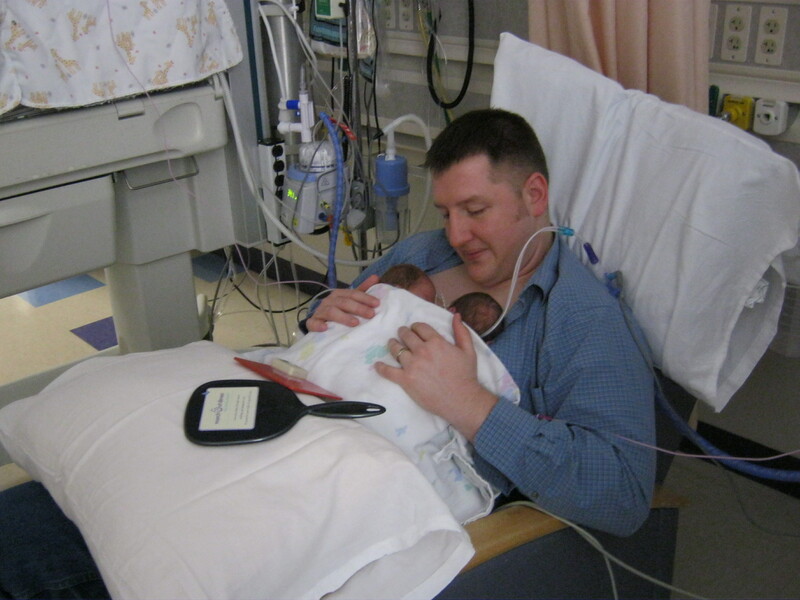 The doctors were still concerned about Elijah’s Bradycardia episodes but they were decreasing. They also had some concern for Elizabeth’s blood clots and possible eye infections. We discussed with the doctors what could be filmed. Due to their eyes still developing, the camera would not be allowed in the room because of the bright light. Also, we still need to reduce the level of noise as much as possible so the filming was taken from a ways away. For those that did see the newscast and are wondering where the pictures came from. Look no further than this blog. When we take pictures we do not use flash. Once we were done with the interview and filming, we headed home to get a quick nap before the Greater Kansas City Mothers of Twins Club Garage Sale (www.gkcmotc.com). Unfortunately, as always, it took us longer to get home than we wanted so we pretty much just had time to pump before the sale. Boy, are we glad we went! We were able to pick up a double stroller (that matches the one we already have), three bumbos, three boppies, and some other baby stuff that we needed. After this we headed to Hy-Vee. We had approximately 200 dollars of free coupons that my co-workers got for us. We figured Friday would be pretty dead at a grocery store and we could easily get through the line. Of course, before we were able to make it through the line, we engaged in a scavenger hunt to procure the items on the coupons. The whole shopping trip took about two hours! As far as I can remember this is the longest grocery run I have ever been on! I’m sure other people might think this was a short trip. In the future, I would imagine we will be much quicker. In our defense, I think this is the most groceries we have ever purchased at one time. The deep freeze that my co-workers got us is packed to the gills. Thank you so much for blessing us with the deep freeze and the food. When we finally got home that night we barely made it in time for the 10 o clock news. For those who haven’t seen the report, here it is: http://www.youtube.com/watch?v=BxgT9WjF0v4. Saturday, we slept in, but even then we still felt exhausted all day. We spent all of Saturday at the hospital holding the bambinos before going to dinner with my parents at Becca’s new favorite restaurant Los Tulles. Check it out sometime if you like good Mexican and if you like it cheap. It’s off Broadway. I’ll tell you this though, Saturday nights they are not fast. Sunday, we hit the jackpot and were able to do tandem holding. This is when we hold more than one at a time. This was a thrill! I think the babies enjoyed it too! 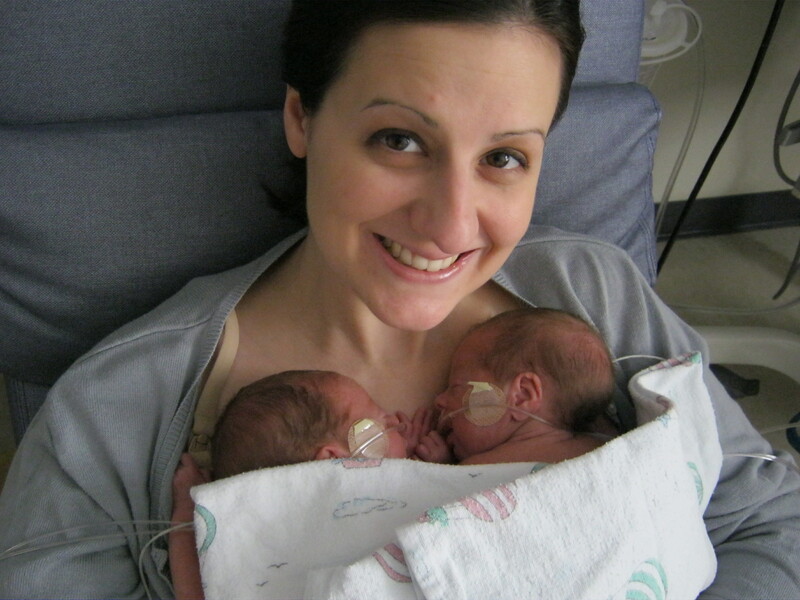 I held Elijah and Elizabeth. Usually Elijah is Mr. Cool, all calm and collected. He got a little upset that he had to share daddy’s chest with his sister and kept making noises and reaching for her face and feeding tube. It got scary for a second when Ellie started to wiggle and slide off me. I started to freak cause I pretty much had one baby pre arm to support so I hit the button for the nurse. Meanwhile, Elizabeth was just sleeping calmly like it was no big deal. When the nurse came in and moved the blanket, it turned out that she hadn’t moved that much and she was fine, but either way we moved her back into position so she would be farther away from the cliff! Becca had Caleb and Abby. They too enjoyed it and were peaceful. 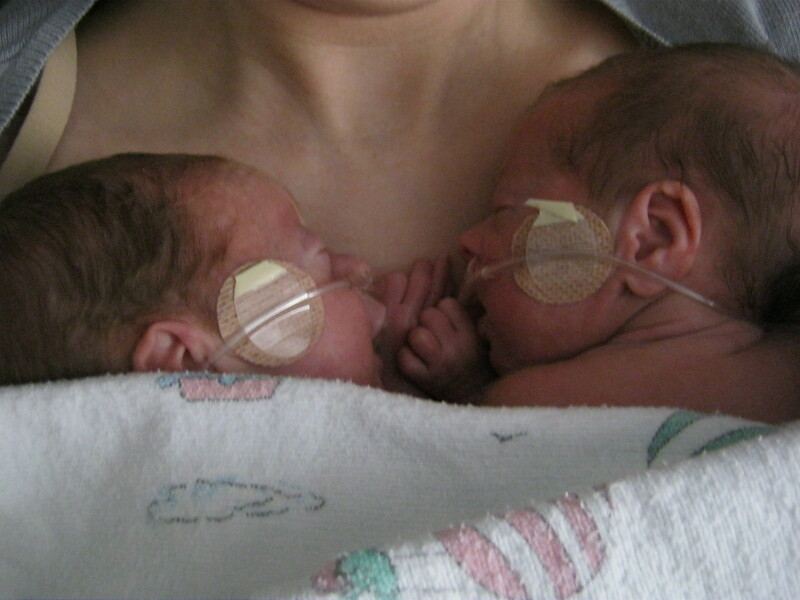 We were only able to hold them tandemly because they were doing so good on their cannula. 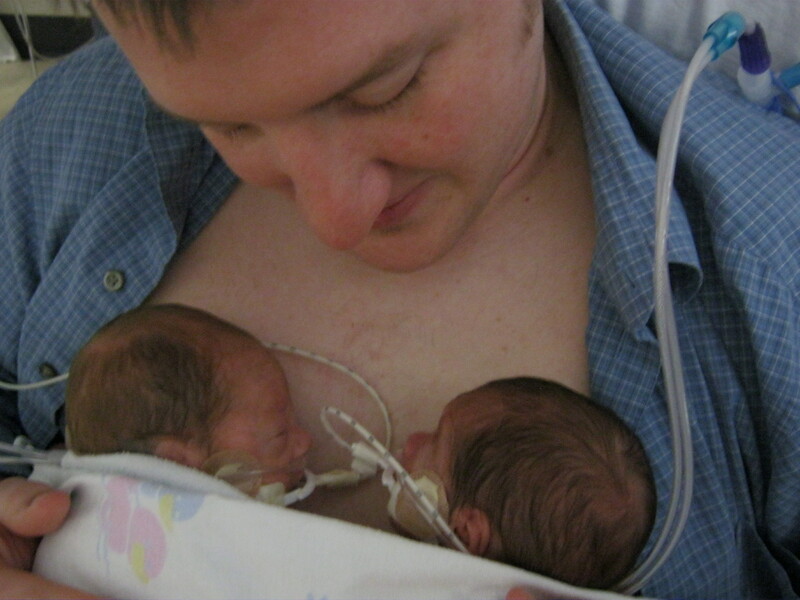 We got to hold them until they started to tire out and started having Bradycardia episodes. Too many of those and it was time for them to go back into their isolletes. Which is just as well because it was time for their Cares and I’m not sure how I would feel about having their diapers changed when laying on my bare stomach. "Daddy? Who is this other kid?!" After this we had some Costco coupons so we went there and stocked up on diapers, wipes, and other items. I like to think we have three to four months of diapers and wipes available to us when these angels come home, but there is no way anyone can possibly know the answer to that until they come home. Monday, we decided to try something different. Rather than heading up to the hospital right after work. We took naps and headed up there later. Unfortunately we got there and found out that they weren’t doing as good on their cannula as they had been over the weekend. Caleb who was the superstar before was actually doing the worst. We were really disappointed in this and were confused why he was removed from cannula just because he had a bad day. Luckily, the staff at St. Luke’s is very patient with us tired parents. They explained that he had several Bradycardia episodes and one was bad enough that they had to get the oxygen bag to resuscitate him. So since they weren’t rocking it out of the park like they were Sunday we could only hold one at a time and we had less than an hour. I choose Caleb because I hadn’t held him in over a week and Becca went with Ellie. Caleb screamed and cried the entire time. He hates being on a CPAP. Finally, I realized the reason he was screaming was the angle I was sitting at so I switched positions and that got him to calm down. So he had about 5 minutes where he wasn’t screaming. Since Monday night, Caleb hasn’t been able to make it back on the cannula. Becca and I are worried that he might have an infection. He was just doing so good and now this seems like quite the slide. He could just be tired, but who knows. Abigail is still doing fine. She isn’t putting on weight as quickly as she has the past weeks so this will give her brothers a chance to catch up with her. It appears that the infection she had a few weeks ago is all gone now. She is still doing six hours on cannula/six hours on CPAP. Elijah is chill. He is still three hours of cannula/9 hours of CPAP. He hasn’t peed on anyone recently either. Today starts the baseball season. My friends and family fall into three fan camps: Royals, Cubs, and Cardinals. As for me and my house we bleed Cardinals Red. Great update, Sean! Keep them coming! I am on the lookout for some awesome Royals gear for the quads. When they are older I will have to have a good long talk with them about how St Louis is bad and Royals are good. :) Go Royals! I just love those pictures with two of them snuggling on you guys! Priceless!! Glad to get the updates on you two and the babies! We've got 4 cases of diapers to donate, we'll leave them at church next time we're in KC. Thanks for the update - praying for you!